For some quick perspective, “Here’s Not Here” is the 71st episode of The Walking Dead. Morgan Jones has been seen in 8 of those episodes. 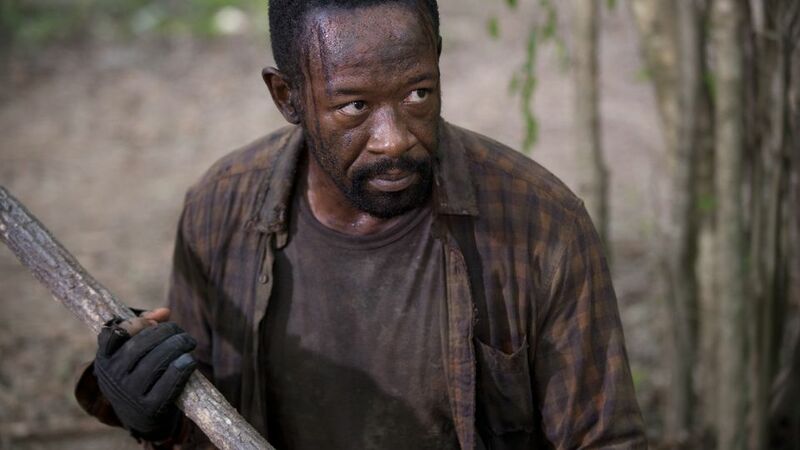 Whether it is the confidence found in Lennie James performance or the way he has been written, it is impressive that Morgan is the character I am most excited to follow. That is why, stuck in between two episodes that let us know if another character has died, I am completely fine watching a flashback episode that details the origins of a person who’s background I could have pieced together on my own. 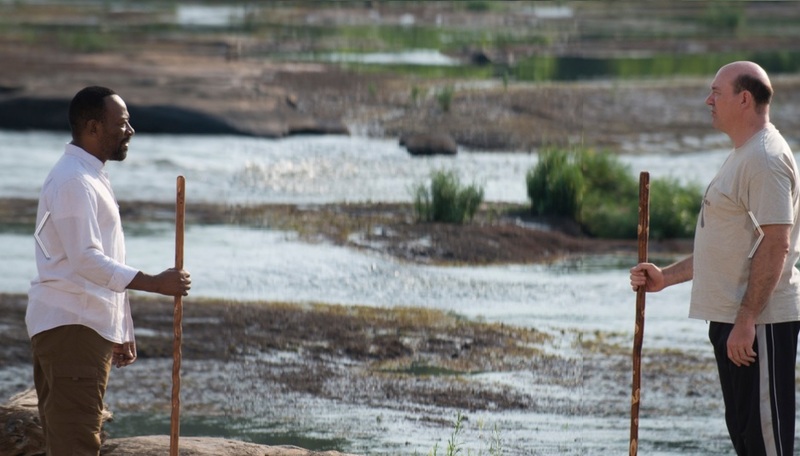 While there’s a quick indication that we are being taken back to the past, the majority of this episode is set after the events of “Clear”, an episode from Season 3, which still holds up as one of the best episodes The Walking Dead has ever produced. All Morgan does is clear, which means killing all that cross his path. 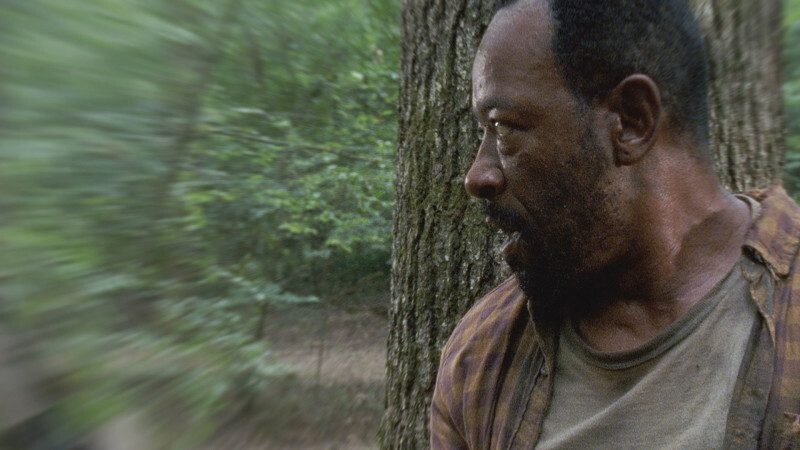 Given how calm and collected Morgan has been in the recent episodes we have seen him in, watching him act like a violent animal is a big change, but a fitting one, given that we know something is coming. Morgan threw away a line about a cheesemaker in “JSS”, but now we have a lot more insight into just what that meant. This 90 minute episode quickly becomes a two-man show between Morgan and Eastman, played by the great character actor John Carroll Lynch. It is as if AMC just has all these great performers on speed dial and can quickly call them in for these special one-off episodes. From here, we learn plenty about Eastman and see him turn Morgan around. While getting distinct details about what kind of training was involved in calming down Morgan and learning how pivotal a role Aikido is in all of this, you can still ask the question of whether or not you needed this episode. The thing is, I can’t say I needed it as far as understanding why Morgan has the skills he now possesses, in addition to his new life philosophy. What I can say, though, is that this show makes great use of its time by delivering an excellent extended hour of television. There will no doubt be many that take issue with the length, the placement of this episode, the lack of moving the narrative forward and the involvement of just two characters (one who you will never see again). It is understandable, but at the same time, forgivable if it means keeping focus on one of the few actors/characters on this show that has never made me roll my eyes. Really, I shouldn’t even have to apologize for the show. Director Stephen Williams and writer Scott Gimple know what they are doing here and they have come up with a brilliant story to focus us in on. A lot of it comes in the details. The way Eastman slowly reveals all there is to know about whom he once was and what he has become is great. Watching the adjustments Morgan makes, as he accepts the position he is in and begins to go along with it is wonderful. Hell, even the goat (RIP Tabitha) is effectively utilized throughout this episode, as we see it become useful in more ways than one. It is not even as if “Here’s Not Here” is reinventing the wheel. The episode has to get around the fact that we basically know the outcome of this story from the beginning. Morgan is never in any danger, as we know he is still alive. Eastman occupies the Obi Wan Kenobi role, which generally means some sort of sacrifice will have to be made. The biggest surprise comes once the flashback ends. That said, even at a leisurely pace, this show (which often has dialogue problems) gets plenty of mileage out of its writing. Having two great actors work with certainly helped. By the time things ended, one will now wonder where it all goes. I may have not been as savvy as some others were, when it came to determining whether or not Morgan killed “Shaggy The Wolf”, but knowing that answer now, nothing good can come of this. It is that kind of assurance I have, which makes me intrigued by how far Morgan’s training will take him, while also being worried about what repercussions will occur. Everything about the Wolves tells me they are evil. They are the evil that Eastman faced when talking about Creighton Dallas Welton. Hopefully Morgan does not have to find that out the hard way. Sadly, this being The Walking Dead that will more than likely end up being the case. 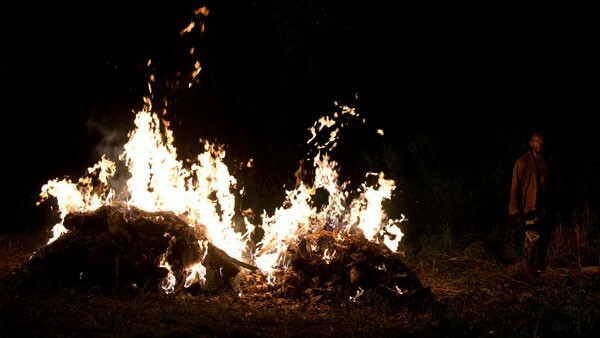 This is another great episode in what has so far been a tremendous season of The Walking Dead. Some will not be pleased with the break from the million walker march and the continued ambiguity over the fate of our favorite pizza delivery boy. That’s fine, but any show that can take an unnecessary concept, such as this, and somehow find all the right beats to hit for making a well-acted, well-produced hour of television is perfectly fine by me. Thank you, Morgan. 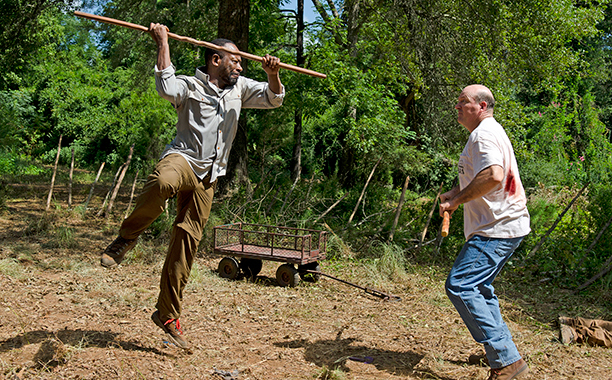 Zombie Kill of the Week: Morgan impales a walker on the back of a three-legged stool. That’s pretty gnarly. John Carroll Lynch is tremendous in this episode and I fully support him getting a guest acting Emmy nomination. You were a good goat Tabitha. You attracted many walkers, but you produced the milk that led to good cheese…eventually. Will we finally get the reveal of Glenn’s fate next week? Stay tuned…unless more Wolves turn up to cause trouble. Pesky Wolves! Previous ArticleAlbum Review: The Chills - “Silver Bullets"